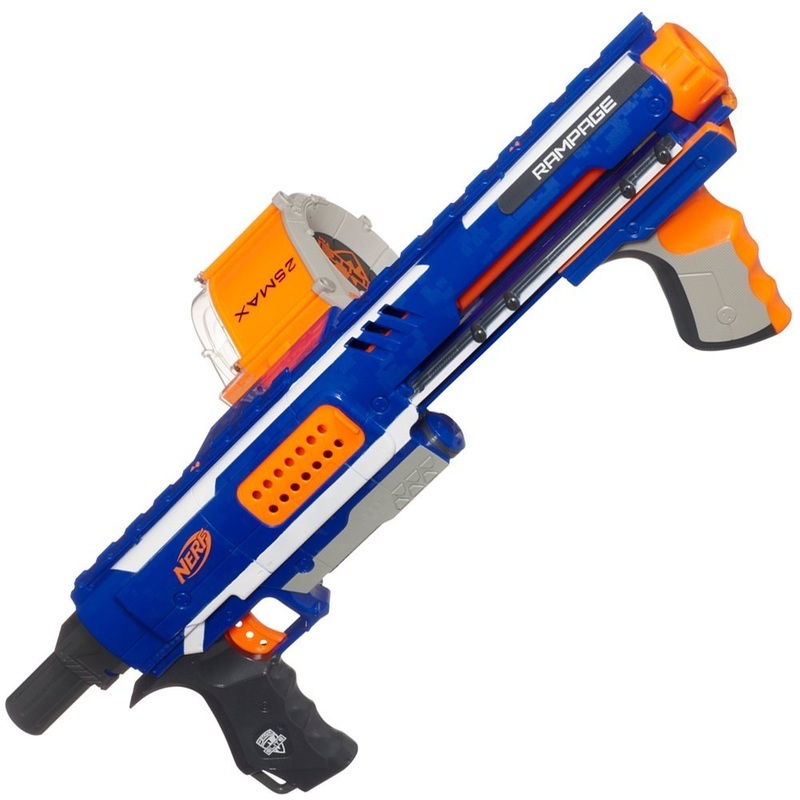 A reliable, rapid firing primary blaster from the Nerf N-Strike Elite Line. 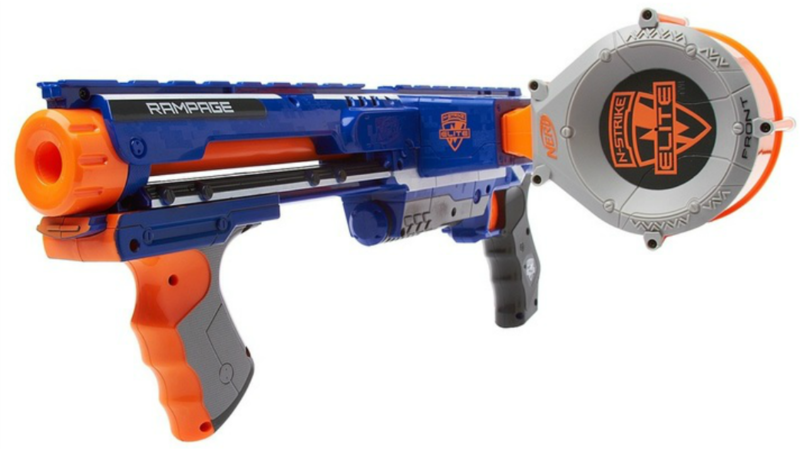 This is the high-capacity, all around spring powered blaster from Nerf. It has many qualities that make it a good option for medium to long range combat. This blaster has many strengths, making it versatile for different ranges and game types. The pump foregrip, slam fire capability, and 25-dart drum mag make it an effective, rapid firing blaster in close quarters. The Rampage's elite range paired with an extra stock attachment can make it a stable, accurate, and pretty powerful at mid to long range. The clean double rail configuration on the top of the blaster is a good, no nonsense iron sight that is simple and useful for aiming. The single sling point on the handle is a bit unbalanced, but it serves its purpose well enough. The Rampage's side-loading mag well is a feature that may be seen as unbalanced and annoying, but it opens up the space under the barrel for the user's hand to prime and pump the foregrip. Included are the blaster itself, a 25-round drum mag, and 25 darts to load it up. It's a spring blaster, which means that you don't have to buy batteries for it, and it won't lose power; making it reliable. 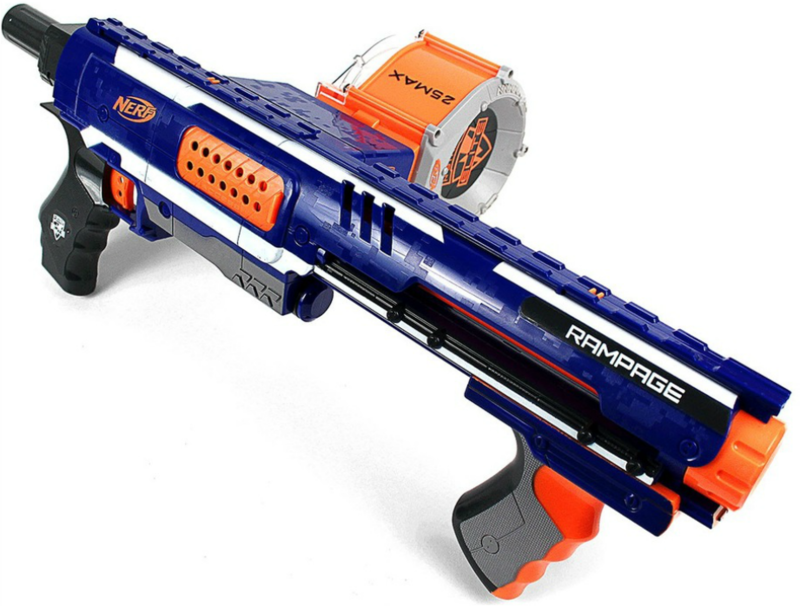 The one potential problem with the Rampage is the possibility of jamming, if the blaster is primed only partially or too quickly. The 25-dart drum mag that it comes with is also a very nice addition; you can shoot for quite a long time if you know how to spend your ammunition wisely. My favorite thing about the Rampage is the strong punch that it packs compared to other blasters. Overall, I really like this blaster from the N-Strike Elite line, because it has many of the qualities that make it a solid blaster in my opinion. In a nutshell, it's a rapid firing, high power, high capacity, clip fed spring blaster; an ideal blaster for casual foam battle. I would definitely recommend the Nerf Rampage to those looking for a bit of foam-filled fun.